A short but very readable book by Ilan Wurman. Like me, a physics major who went on to less complex work. On legal topics, I wear the "dilettante" label, not proudly, but honestly. I've found myself in the too-deep end of the pool while reading in this area before. I'm happy to report this is a Goldilocks book: "just right" for my level of understanding and background. If the earth be the gift of nature to the living, their title can extend to the earth in its natural State only. The improvements made by the dead form a debt against the living who take the benefit of them. This debt cannot be otherwise discharged than by a proportionate obedience to the will of the Authors of the improvements. Wurman makes the case, with Madison, against those who prefer the Constitution to be treated as a "living, breathing document." To quote Jonah Goldberg: we "like our Constitution like our beef jerky — cold, dead, tough to chew through." That's cute, maybe a little too cute for a serious scholar like Wurman. He carefully teases apart the various issues involved in originalism, best stated as the belief that the Constitution's words and phrases should be interpreted according to their original public meaning. He argues that this should be no different from "interpreting" an 18th century recipe for fried chicken: if the recipe stipulates "pepper to taste", it means (a) you've got considerable leeway as to the amount of pepper you put in; (b) it would be an unconscionable error to say "well, let's just use rosemary, instead"; (c) if, in the 18th century, "pepper" meant something other than what we mean today, then you should go with that "original" meaning. Wurman argues against a number of people, including (most important to me) Randy Barnett and Richard Epstein, who have contended that Constitutional interpretation should proceed from a "presumption of liberty". But also against folks who argue that legislative and executive laws be given the "presumption of constitutionality." He also approaches the issue of the Constitution's legitimacy; which, on its face, seems problematic for a document whose "We the people" preamble refers to no actual people living today. He makes (at least to my ears) a unique argument about how the Constitution is rooted from the Declaration of Independence three different ways: (1) the easy one, it enshrines the inalienable natural rights of individuals; but also (2) it establishes a democratic order of government, undoing the wrongs of George III; and (3) it was ratified by methods of popular sovereignity, another source of George III gripes. Prudence was the 596th-most-popular name for US girl babies in the 1880s, but slipped to its current near extinct status by the 1950s. But Mia Farrow has a sister named Prudence (born 1948), and she was the inspiration for the Beatles' song "Dear Prudence". The lads met her at the Maharishi's Transcendental Meditation clinic in India. The song's lyric "Won't you come out and play" was a reference to her habit of retreating to her room to practice TM. 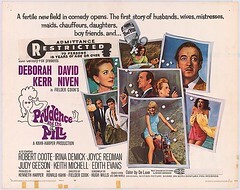 And of course, there's the long-forgotten Deborah Kerr/David Niven movie, our Pic du Jour. R-rated in 1968! The annual State of the Union pageant is a hideous, dispiriting, ugly, monotonous, un-American, un-republican, anti-democratic, dreary, backward, monarchical, retch-inducing, depressing, shameful, crypto-imperial display of official self-aggrandizement and piteous toadying, a black Mass during which every unholy order of teacup totalitarian and cringing courtier gathers under the towering dome of a faux-Roman temple to listen to a speech with no content given by a man with no content, to rise and to be seated as is called for by the order of worship — it is a wonder they have not started genuflecting — with one wretched representative of their number squirreled away in some well-upholstered Washington hidey-hole in order to preserve the illusion that those gathered constitute a special class of humanity without whom we could not live. It’s the most nauseating display in American public life — and I write that as someone who has just returned from a pornographers’ convention. Disgraced MSU president Lou Anna Simon sounds like a really terrible person, too. Apparently the president of Michigan State didn’t care how many girls and women were molested in the years following the juncture at which the school was warned and failed to act, but did care about her own taxpayer-financed perks. Gymnast Rachael Denhollander went public in 2016, yet Simon kept denying anything was wrong. Michigan State took no action to defend minor girls, but was quick to retain the law firm Skadden Arps to defend itself from liability for the school’s villainy. Simon’s contract, which rings of cronyism and corruption, calls for her to receive more than half a million dollars per year essentially for life, no matter how poorly she performed. Now Simon has ruined the reputation of Michigan State University—but what’s that to her, since she gets her payday and her free benefits? Like [NCAA head Mark Emmert], Simon at MSU knew there would always be money and never be accountability. Tough but on-target. NCAA delenda est. I would guess that most NFL defensive tackles do not have either Salave'a's wit or vocabulary. How could former deputy director of the FBI Andrew McCabe assume an oversight role in the FBI probe of the Clinton email scandal when just months earlier his spouse had run for state office in Virginia and had received a huge $450,000 cash donation from Common Good VA, the political-action committee of long-time Clinton-intimate Terry McAuliffe? Again, the answer was clear. McCabe assumed that Clinton would easily win the election. Far from being a scandal, McCabe’s not “loaded for bear” oversight of the investigation, in the world of beltway maneuvering, would have been a good argument for a promotion in the new Clinton administration. Most elite bureaucrats understood the Clinton way of doing business, in which loyalty, not legality, is what earned career advancement. Bottom line: FBI and DOJ folks bet a lot on the wrong horse, knowing they'd never get called out for it if Hillary had won. ■ At Reason, Christian Britschgi relates: Politicians, Media Freak Out Over Elon Musk's Flamethrowers. Firearm regulation often has more to do with a weapon's looks than its lethality. Nothing illustrates this better than the sudden freakout over Elon Musk's new flamethrower venture. Musk's Boring Company started taking preorders of its $500 "world's safest" flamethrowers this past weekend. Musk claims to have already sold some 15,000 units, which he promises to ship come the spring. Statist blanch at this factoid: "neither the federal government nor 48 of the states have any laws on the books regarding flamethrowers." ■ Pun Salad Close Personal Friend Dave Barry points to this WMUR story: NH bill would punish owners of trespassing chickens. The Legislature is considering a bill that would make trespassing fowl a violation, not for the chicken but for its owners. Under the proposal, anyone who knowingly, recklessly or negligently allows fowl to enter or travel over someone else's property without permission can be convicted of a violation. Trespassing Chickens? As Dave notes: "We saw them open for the Clash." ■ As the Babylon Bee reports: After Killing 20-Week Abortion Ban, Democrats Resume Lecturing People About Compassion. According to sources within the Senate, Democratic legislators took a short break from their tireless schedule of lecturing the nation about compassion Monday in order to vote against a ban on the barbaric practice of ripping helpless 20-week-old babies limb from limb and pulling them from the wombs of their mothers. Sometimes the Bee, um, stretches the truth. This is not one of those times.